Midland’s economic landscape is expected to look very different, even compared to November when Scott Sheffield celebrated the opening of his company’s new regional office building. Fueled by a thriving oil and gas industry powered by strong commodity prices, Midland has boasted one of the strongest, if not the strongest, economies in the nation. But current crude prices are half of the $107 peak that was reached in June, companies have slashed budgets and activity plans, and layoff announcements are becoming a daily occurrence. 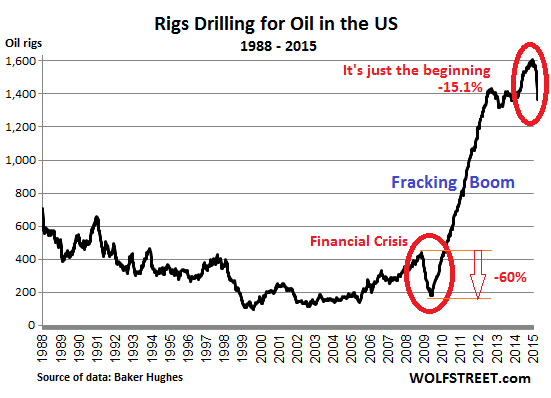 Already the nation’s rig count has fallen from a high of about 1,960 to 1,300. The Permian Basin rig count may fall to 300 rigs before beginning to rebound this summer. Sheffield, chairman and chief executive officer of Pioneer Natural Resources, said during a visit to Midland last week that this is the industry’s fifth major downturn since he arrived in Midland in 1979. This downturn is more significant, in part because the root cause is different, he said. He discounted the 2008-2009 downturn, caused by the Great Recession that depressed demand globally, because prices rebounded quickly. Previous downturns were caused by other nations trying to take market share from the Organization of Petroleum Exporting Countries, particularly Saudi Arabia. They would then react by increasing supplies that would exceed demand, sending prices lower. This time, “we were too good at our jobs” and developed shale plays that have added 4.5 million barrels of oil a day to the nation’s output. The United States has become the world’s largest producer of oil and natural gas and the nation’s crude inventories are at 80-year highs. “The additional production is a game-changer for the Permian Basin, for the Untied States, for the industry,” he said. Permian Basin production has soared from about 750,000 barrels a day in 2007 to a little more than 1.9 million barrels a day today. Midland will recover, “but not as strong as six months ago,” Sheffield said. He stands by his prediction that Midland’s population will grow to 200,000, but thinks it will take longer — maybe 12 years — to reach that figure. “We know the oil is here; it will always be here. We know in the Midland Basin, in the Delaware Basin, you can always make a well,” he said. The Spraberry-Wolfcamp formation that lies under Midland contains an estimated 75 billion recoverable barrels of oil equivalent, he said. The Midland Basin has several stacked plays, and operators already have proven 10 zones reaching down about 4,000 feet, he said. The Delaware Basin has an estimated 25 billion barrels, but “not enough work is being done there,” he said. He predicted the industry will become more cyclical and hedging of oil prices by operators will be a major component of their operations. “The Permian Basin will come back; I just can’t tell you if it will be at $60 or $70 or $80 oil,” he said. The world population will rise from 6 billion to 9 billion people and they will need oil for their energy needs. “The world needs the Permian Basin,” Sheffield said. He said Saudi Arabia doesn’t want to eliminate the nation’s shale production but to slow it down because the Saudis know the world will need that oil in the future. Sheffield said lifting the 40-year ban on exporting domestic crude could be a key to improving the industry’s fortunes. He said he has spent a lot of time in the nation’s capital educating lawmakers, regulators and President Obama’s staff on the benefits of lifting the ban. “My main point is the differential is widening,” he said, referring to the price differences between West Texas Intermediate and Brent grades, and even between West Texas Intermediate-Midland and West Texas Intermediate-Cushing. For most of the past 40 years, WTI and Brent brought prices within $1 or $2 of each other, he said. But over the last three years, that gap has widened to an average of $15 a barrel. Currently, it is about $8 a barrel and is expected to increase. There is also a gap between Midland and Cushing grades because Cushing storage is expected to reach capacity in the next couple of months and there is still limited pipeline transportation to send Midland crudes to other markets, such as the Gulf Coast. Pioneer and other producers want the flexibility to send their product to the Gulf Coast or to overseas refiners that are configured to process the light, sweet crude coming out of the shale plays. This would help narrow the differential, he said. “That extra $8 or $10 a barrel would have a tremendous impact on production, on jobs, on investment,” he said. It could also benefit consumers because gasoline prices are based on the price received for Brent, with is about $8 higher than West Texas Intermediate. Eliminating the ban now, while crude prices are low, could lessen the impact of higher gasoline prices should they rise in response, he said. He thinks the ban has a 50-50 chance of being lifted this year but virtually no chance next year — an election year. “I’m 80 to 90 percent confident it will get done by 2017,” he said. This entry was posted in oil and gas, OPEC, Uncategorized and tagged Midland Texas, Odessa Texas, Permian Basin, Pioneer Natural Resources, Scott Sheffield, Texas, WTI on February 22, 2015 by Bone Fish. In the $1.6 trillion-a-year oil business, there are global titans like Exxon Mobil Corp. (XOM) that wield more economic might than most of the nations on Earth, and scores of wildcatters scouring land and sea for the next treasure troves of crude. Then there are the strippers. For these canaries in the proverbial coal mine, the journey keeps going deeper and darker. Strippers are scavengers who make a living by resuscitating once-prolific oil fields to coax as little as a bathtub full of crude a day from each well. Collectively, the strippers operate almost half-a-million oil wells that produced more than 730,000 barrels a day in 2012, the most recent year for which figures were available. That’s one of every 10 barrels produced in the U.S. — equivalent to the entire output of Qatar, or half the crude Royal Dutch Shell Plc (RDSA), Europe’s largest energy company, pumps worldwide every day. With oil prices down 58 percent since June, these smallest of producers will be the first to succumb to the Great Oil Bust of 2015. “This is killing us,” said Todd Shulman, a University of Colorado-trained geologist who ran fracking crews in the Rocky Mountains before returning to Vandalia, Illinois, in 1984 to help run the family’s stripper well business. Todd Shulman stands with his father and sons in May 2006 during the drilling of the C.T. Williams #1, in St. James Field, Fayette County, Illinois. 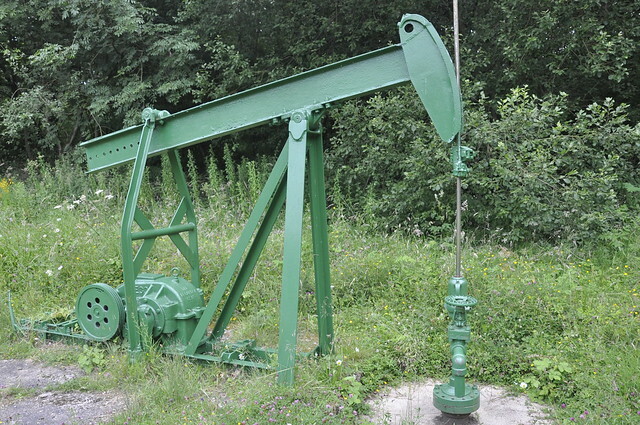 Stripper wells — an inglorious moniker for 2-inch-wide holes that produce trickles of crude with the aid of iconic pumping machines known as nodding donkeys — were a vital contributor to U.S. oil production long before the shale revolution. Though a far cry from the booming shale gushers that have pushed American crude production to the highest in a generation, stripper wells are a defining image of the oil business, scattered throughout rural backwaters abandoned by the world’s oil titans decades ago. With the price of crude dipping so low, there’s no way Shulman will be able to drill a new well that regulators have already permitted. Nor is he even going to turn on a well finished last month that’s ready to start production. It would be foolhardy to harvest crude from wells that won’t pay for themselves, said Shulman, who scrapes remnants from old Texaco (CVX) and Shell fields 310 miles south of Chicago, in the heart of what had been a booming oil region in the 1930s. He’ll wait for prices to rebound. The economics of most stripper wells stop making sense when Brent crude, the benchmark for more than half the world’s oil, drops under $50 a barrel, U.K.-based Wood Mackenzie Ltd. said in a Jan. 9 note to clients. Brent fell as much as 2.2 percent to $47.78 a barrel in London today, and lost 48 percent of its value for the full year 2014 amid faltering global demand and rising U.S. output that fed a supply glut. Although stripper wells extract only a tiny fraction of the oil reaped from a successful shale development, a stripper can be drilled for less than $300,000, compared with $7 million to $9 million for shale wells, which require hydraulic fracturing, or fracking, to flow oil and natural gas. For stripper-well operators like Shulman and thousands of others across the U.S., the situation is especially dire: unlike shale fields that can be quickly shut down and restarted in response to price swings, stripper operations are geologically and technically delicate. Shut a stripper well down and chances are the bottom of the hole will fill with water or permanently clog with sand and you’ll never see another barrel of oil, said Brad Gessel, who operates 200 stripper wells in fields formerly owned by the likes of Shell near Whittington, Illinois. “If you shut it in, you may never get that production back again,” Craig Hedin, a veteran Illinois oil lawyer whose four-decade career included helping negotiate Exxon’s 1989 sale of the sprawling Loudon field in 1989. Loudon was a 400 million-barrel jewel in Exxon’s crown for half a century until output slowed to such a slow gurgle that it was no longer worth the company’s attentions. Now, the 25-mile vein of oil-soaked rock north of Vandalia is being worked by strippers. Before considering the last resort of shutting down producing wells, stripper owners are coping with low prices much like every other oil company. First, they’re suspending new drilling, Gessel said in an office at the back of an industrial showroom stocked with heavy-duty elbow pipes, gauges and other gear sold by the family’s other line of business, Gessel Pump Sales & Service Inc. The next step is to look for cost-cutting measures in the field and office, and defer new equipment purchases, said the 55-year-old Gessel. Finally, they’d have to lay off employees and Gessel would stop taking a paycheck himself. It got that bad just 17 years ago. Every drop of crude produced in Illinois comes from stripper wells, rather than conventional wells or shale formations, according to the Interstate Oil and Gas Compact Commission. That’s a higher proportion of stripper-oil supply than any other crude-producing state except Missouri, which also gets 100 percent of its oil from scavenged fields. The vast majority of Illinois’s oil is fed into Countrymark Cooperative Holding Corp.’s refinery in nearby Mt. Vernon, Indiana. The price Countrymark, a closely held Indianapolis-based maker of fuel for farmers, pays oil producers averages about $7 a barrel less than the U.S. benchmark, West Texas Intermediate crude. The discount accounts for transportation costs incurred by Countrymark to gather and ship the oil to the refinery by truck and pipe. That means that last week, when WTI dipped as low as $44.20, Illinois crude fetched less than $38. “I’m going to try not to lay anybody off because we’ve spent years building a really good workforce,” said Gessel, who started the company with his father and brother in 1980 by kicking in $5,000 apiece. The company now employs 25 workers, including two full-time geologists. Gessel is betting shale drillers in North Dakota and Texas carrying heavy debt loads and multi-million dollar well costs will fold before stripper operators like him. Bakken crude, which like Illinois oil trades at a discount to the benchmark to account for shipping costs, fetched $39.97 a barrel on Jan. 13 before rebounding to $43.08 the next day. The price’s 2014 peak was $103.01 in June. This entry was posted in Energy, Gas Price, oil and gas, OPEC and tagged Exxon Mobil Corp., Nodding Donkey, Royal Dutch Shell Plc, Scavengers, stripper wells, Strippers on January 20, 2015 by Bone Fish. Events are moving faster than brains now. Isn’t it marvelous that gasoline at the pump is a buck cheaper than it was a year ago? A lot of short-sighted idiots are celebrating, unaware that the low oil price is destroying the capacity to deliver future oil at any price. The shale oil wells in North Dakota and Texas, the Tar Sand operations of Alberta, and the deep-water rigs here and abroad just don’t pencil-out economically at $45-a-barrel. So the shale oil wells that are up-and-running will produce for a year and there will be no new ones drilled when they peter out — which is at least 50 percent the first year and all gone after four years. Anyway, the financial structure of the shale play was suicidal from the get-go. You finance the drilling and fracking with high-yield “junk bonds,” that is, money borrowed from “investors.” You drill like mad and you produce a lot of oil, but even at $105-a-barrel you can’t make profit, meaning you can’t really pay back the investors who loaned you all that money, a lot of it obtained via Too Big To Fail bank carry-trades, levered-up on ”margin,” which allowed said investors to pretend they were risking more money than they had. And then all those levered-up investments — i.e. bets — get hedged in a ghostly underworld of unregulated derivatives contracts that pretend to act as insurance against bad bets with funny money, but in reality can never pay out because the money is not there (and never was.) And then come the margin calls. Uh Oh…. In short, enjoy the $2.50-a-gallon fill-ups while you can, grasshoppers, because when the current crop of fast-depleting shale oil wells dries up, that will be all she wrote. When all those bonds held up on their skyhook derivative hedges go south, there will be no more financing available for the entire shale oil project. No more high-yield bonds will be issued because the previous issues defaulted. Very few new wells (if any) will be drilled. American oil production will not return to its secondary highs (after the 1970 all-time high) of 2014-15. The wish of American energy independence will be steaming over the horizon on the garbage barge of broken promises. And all, that, of course, is only one part of the story, because there is the social and political fallout to follow. Meanwhile, there will be plenty to contend with state-side. The next time there is a pratfall in the stock and bond markets and the TBTF banks — and there is sure to be — the rescue tricks are liable to be a whole lot more severe than the TARP, ZIRP, and QE hijinks of 2008-2015. Next time around, the federals are going to have to confiscate stuff, break promises, take away things, and rough some people up. The question is how much of this abuse will the public take? I take a certain comfort knowing how heavily armed America is. And not just the lunatic fringe. The thought of Hillary and Jeb out there beating the bushes for big money makes me laugh. They are so not going happen. Just wait. For now, take this MLK holiday break to reflect on the fragility of our own country, and gird your loins for the week to come. This entry was posted in America, Gas Price, oil and gas, OPEC, Uncategorized and tagged Permian Basin, shale oil, shale oil wells, Texas on January 19, 2015 by Bone Fish. When money was growing on trees even for junk-rated companies, and when Wall Street still performed miracles for a fee, thanks to the greatest credit bubble in US history, oil and gas drillers grabbed this money channeled to them from investors and refilled the ever deeper holes fracking was drilling into their balance sheets. But the prices for crude oil, US natural gas, and natural gas liquids have all plunged. Revenues from unhedged production are down 40% or 50%, or more from just seven months ago. And when the hedges expire, the problem will get worse. The industry has been through this before. It knows what to do. Layoffs are cascading through the oil and gas sector. On Tuesday, the Dallas Fed projected that in Texas alone, 140,000 jobs could be eliminated. Halliburton said that it was axing an undisclosed number of people in Houston. Suncor Energy, Canada’s largest oil producer, will dump 1,000 workers in its tar-sands projects. Helmerich & Payne is idling rigs and cutting jobs. Smaller companies are slashing projects and jobs at an even faster pace. And now Slumberger, the world’s biggest oilfield-services company, will cut 9,000 jobs. It had had an earnings debacle. It announced that Q4 EPS grew by 11% year-over-year to $1.50, “excluding charges and credits.” In reality, its net income plunged 81% to $302 million, after $1.8 billion in write-offs that included its production assets in Texas. To prop up its shares, it announced that it would increase its dividend by 25%. And yes, it blew $1.1 billion in the quarter and $4.7 billion in the year, on share buybacks, a program that would continue, it said. Financial engineering works. On Thursday, its shares were down 35% since June. But on Friday, after the announcement, they jumped 6%. All these companies had gone on hiring binges over the last few years. Those binges are now being unwound. “We want to live within our means,” is how Suncor CFO Alister Cowan explained the phenomenon. Because now, they have to. Larger drillers outspent their cash flows from production by 112% and smaller to midsize drillers by a breathtaking 157%, Barclays estimated. But no problem. Wall Street was eager to supply the remaining juice, and the piles of debt on these companies’ balance sheets ballooned. Oil-field services companies, suppliers, steel companies, accommodation providers… they all benefited. Now the music has stopped. Suddenly, many of these companies are essentially locked out of the capital markets. They have to live within their means or go under. California Resources, for example. This oil-and-gas production company operating exclusively in oil-state California, was spun off from Occidental Petroleum November 2014 to inflate Oxy’s share price. As part of the financial engineering that went into the spinoff, California Resources was loaded up with debt to pay Oxy $6 billion. Shares started trading on December 1. Bank of America explained at the time that the company was undervalued and rated it a buy with a $14-a-share outlook. Those hapless souls who believed the Wall Street hype and bought these misbegotten shares have watched them drop to $4.33 by today, losing 57% of their investment in seven weeks. Its junk bonds – 6% notes due 2024 – were trading at 79 cents on the dollar today, down another 3 points from last week, according to S&P Capital IQ LCD. Samson Resources is barely hanging on. It was acquired for $7.2 billion in 2011 by a group of private-equity firms led by KKR. They loaded it up with $3.6 billion in new debt and saddled it with “management fees.” Since its acquisition, it lost over $3 billion, the Wall Street Journal reported. 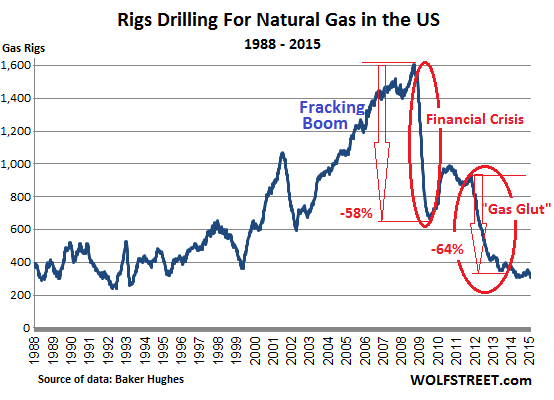 This is the inevitable result of fracking for natural gas whose price has been below the cost of production for years – though the industry has vigorously denied this at every twist and turn to attract the new money it needed to fill the holes fracking for gas was leaving behind. Having burned through most of its available credit, Samson is getting rid of workers and selling off a big part of its oil-and-gas fields. According to S&P Capital IQ LCD, its junk bonds – 9.75% notes due 2020 – traded at 26.5 cents on the dollar today, down about 10 points this week alone. Halcón Resources, which cut its 2015 budget by 55% to 60% just to survive somehow, saw its shares plunge 10% today to $1.20, down 85% since June, and down 25% since January 12 when I wrote about it last. Its junk bonds slid six points this week to 72 cents on the dollar. Hercules Offshore, when I last wrote about it on October 15, was trading for $1.47 a share, down 81% since July. This rock-bottom price might have induced some folks to jump in and follow the Wall-Street hype-advice to “buy the most hated stocks.” Today, it’s trading for $0.82 a share, down another 44%. In mid-October, its 8.75% notes due 2022 traded at 66 cent on the dollar. Yesterday they traded at 45. Despite what Wall-Street hype mongers want us to believe: bottom-fishing in the early stages of an oil bust can be one of the most expensive things to do. Paragon Offshore is another perfect example of Wall Street engineering in the oil and gas sector. The offshore driller was spun off from Noble in early August 2014 with the goal of goosing Noble’s stock price. They loaded up the new company with debt. As part of the spinoff, it sold $580 million in junk bonds at 100 cents on the dollar. When its shares started trading, they immediately plunged. By the time I wrote about the company on October 15, they’d dropped 68% to $5.60. And the 6.75% notes due 2022 were trading at 77 cents on the dollar. Then in November, Paragon had the temerity to take on more debt to acquire Prospector Drilling Offshore. Two days ago, Moody’s downgraded the outfit to Ba3, with negative outlook, citing the “rapid and significant deterioration in offshore rig-market fundamentals,” “the high likelihood” its older rigs might “not find new contracts,” and the “mostly debt-funded acquisition” of Prospector Drilling. The downgrade affects about $1.64 billion in debt. Today, Paragon’s shares trade for $2.18, down another 61% since October 15. Its junk bonds are down to 58 cents on the dollar. Swift Energy – whose stock, now at $2.37, has been declining for years and is down 84% from a year ago – saw its junk bonds shrivel another eight points over the week to 36 cents on the dollar. “Such movement demonstrates the challenging market conditions for oil-spill credits, with spotty trades and often large price gaps lower,” S&P Capital IQ LCD reported. It boils down to this: these companies are locked out of the capital markets for all practical purposes: at these share prices, they can’t raise equity capital without wiping out existing stockholders; and they can’t issue new debt at affordable rates. For them, the junk-bond music has stopped. And their banks are getting nervous too. Their hope rests on cutting operating costs and capital expenditures, and coddling every dollar they get, while pushing production to maximize cash flow, which ironically will contribute to the oil glut and pressure prices further. They’re hoping to hang on until the next miracle arrives. In both weeks combined, the rig count plunged by 116, or 7.8%. The last time it started plunging like this for two weeks was in December 2007 (also down 7.8%, ironically), at the cusp of the stock market crash. This entry was posted in America, Energy, oil and gas, OPEC, Uncategorized and tagged Bakken, Eagle Ford Shale, Employment, junk bonds, Permian Basin, Private Equity, Wall Street on January 18, 2015 by Bone Fish. NASA has released some new photos and animations of the Earth at Night constructed using cloud-free night images from a new NASA and National Oceanic and Atmospheric Administration (NOAA) satellite – the Suomi NPP. 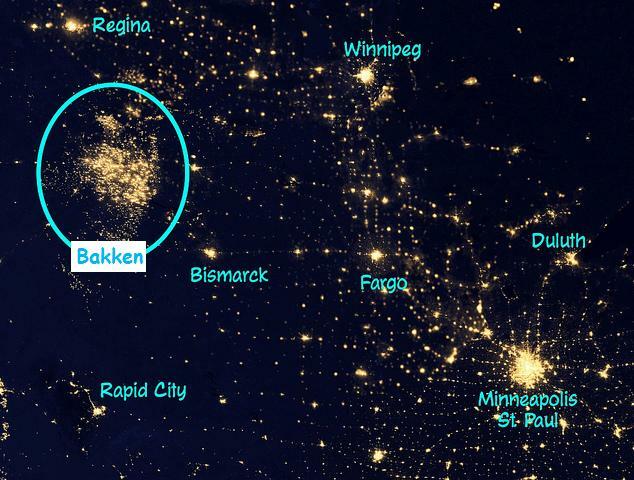 At the “Now It’s All This” blog, the top photo above from NASA is featured in a post titled “Bright Lights, No City.” Amazingly, you can see the bright lights at night spread out all over the Bakken oil fields of western North Dakota, eastern Montana and southern Saskatchewan. 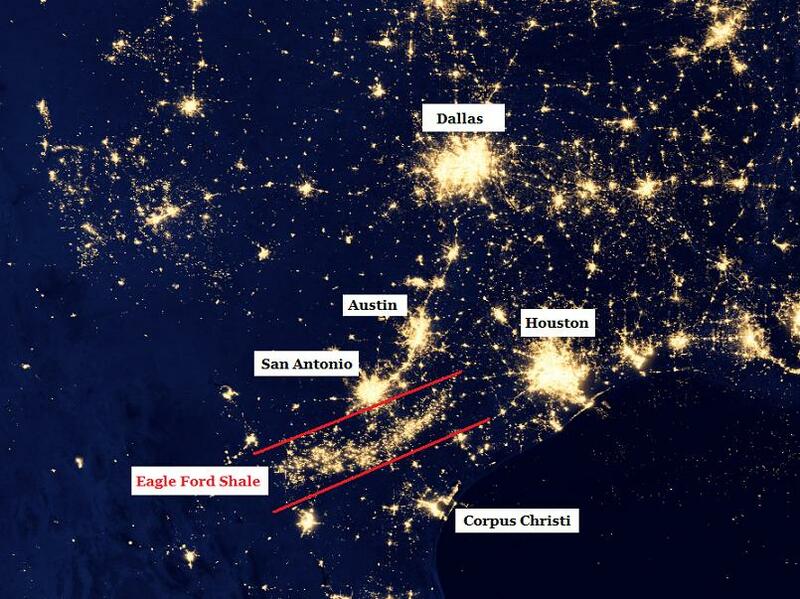 The second photo shows Texas at night, and I’ve highlighted the major cities, along with the bright night lights spread across the oil fields in the Eagle Ford Shale region of Texas (the area between the two red lines). 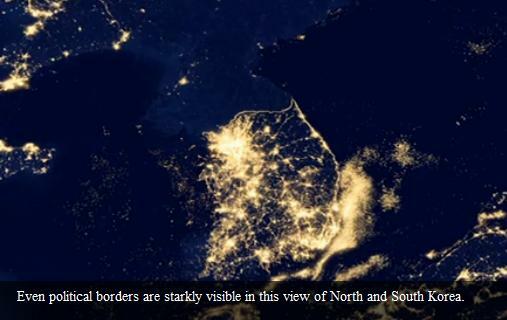 Bonus: The bottom photo was taken from the “Earth at Night” video on the NASA website, and shows the dramatic difference at night between North and South Korea. This entry was posted in America, Energy, OPEC, Uncategorized and tagged Bakken, Bright Lights, Eagle Ford Shale, Earth at Night, NASA, night lights, Permian Basin on January 16, 2015 by Bone Fish.